With more rain coming this weekend, I think we have two options: stand down or embrace the elements and fish. If you choose the latter, my two cents is that the new conditions will force us to fish out of our comfort zones, and that can be immensely rewarding. In extreme conditions, like high water, fish will bury themselves deep in the protective depths. The depths are their bunkers, their places of refuge. Conventional streamers (i.e., traditional coneheads and weighted flies) lack the density to penetrate these bunkers. I think of these fish, positioned in the comforts of their sheltering lie, smug and smiling as they look up at the angler trying to reach them with traditional tools. Extreme conditions call for extreme measures. 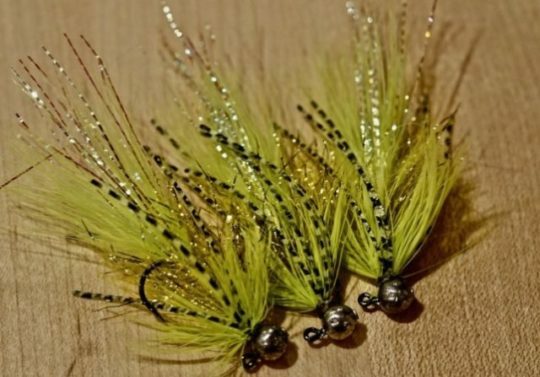 The fly incorporates a combination of yellow and chartreuse, which George has found to be extremely potent. It utilizes an interesting set of materials: chartreuse Marabou, lime Krinkle Flash, yellow Polar Reflector Chenille, and chartreuse Schlappen. In the video at the bottom, moreover, George talks about how soft takes will be and that he registers them visually. He sets the hook when the fly disappears. All the best to you and your family, George. It was great to attend one of your fall clinics. Thank you for all you do! And, as promised, all blog profits go to charities. This year, we are giving to Casting for Recovery and Project Healing Waters (more here).